Music and Words by Stephen Eisenhauer. 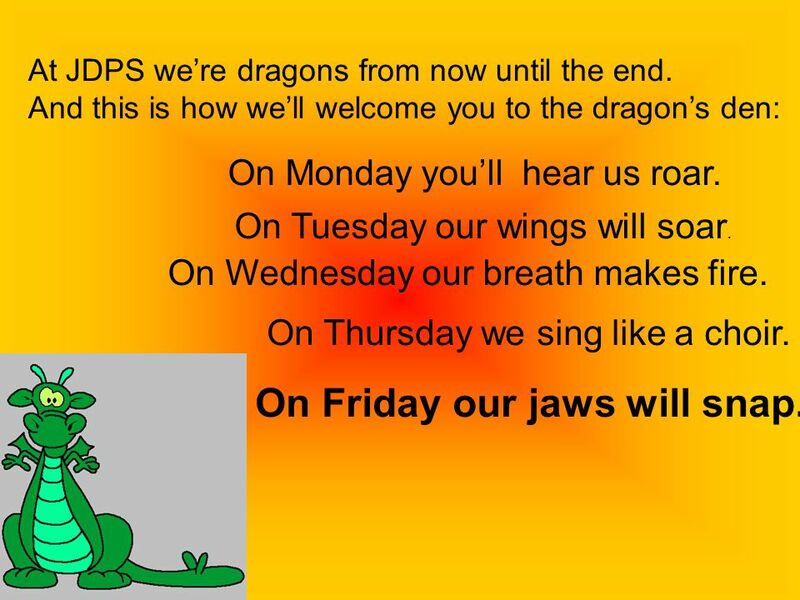 At JDPS we’re dragons from now until the end. And this is how we’ll welcome you to the dragon’s den: On Monday. 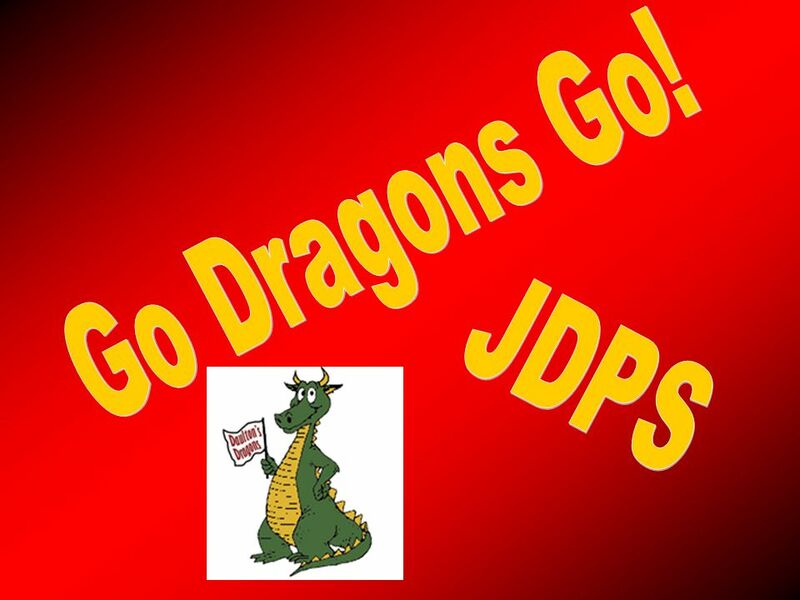 2 At JDPS we’re dragons from now until the end. And this is how we’ll welcome you to the dragon’s den: On Monday you’ll hear us roar. 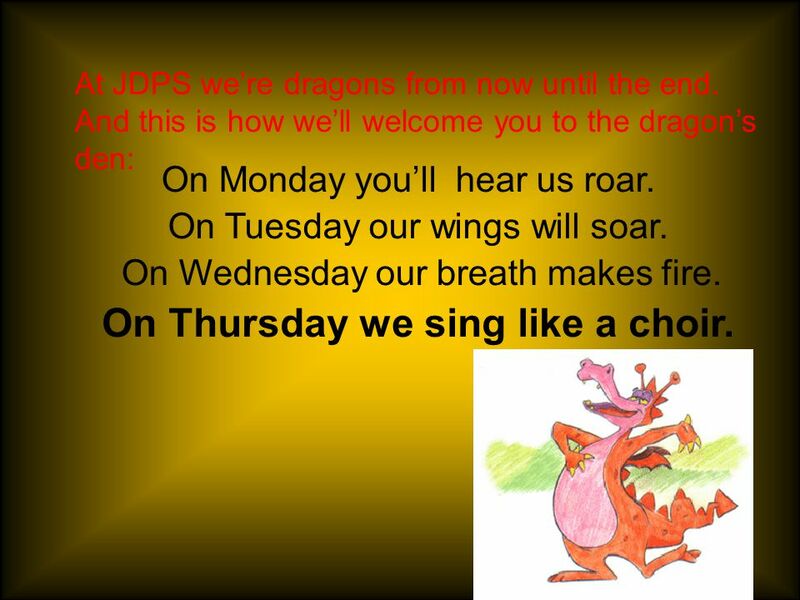 3 At JDPS we’re dragons from now until the end. And this is how we’ll welcome you to the dragon’s den: On Monday you’ll hear us roar. On Tuesday our wings will soar. 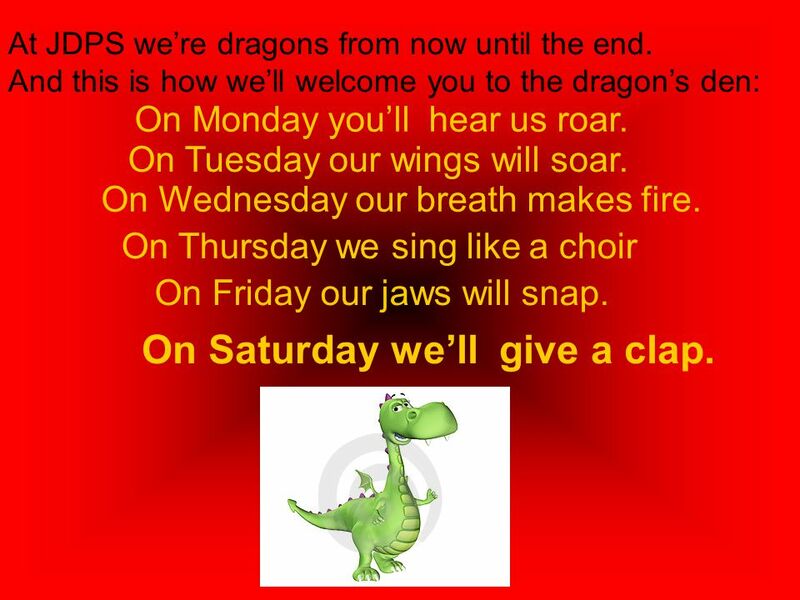 4 At JDPS we’re dragons from now until the end. And this is how we’ll welcome you to the dragon’s den: On Monday you’ll hear us roar. On Tuesday our wings will soar. On Wednesday our breath makes fire. 5 At JDPS we’re dragons from now until the end. And this is how we’ll welcome you to the dragon’s den: On Monday you’ll hear us roar. On Tuesday our wings will soar. On Wednesday our breath makes fire. On Thursday we sing like a choir. 6 At JDPS we’re dragons from now until the end. And this is how we’ll welcome you to the dragon’s den: On Monday you’ll hear us roar. On Wednesday our breath makes fire. On Tuesday our wings will soar. On Thursday we sing like a choir. On Friday our jaws will snap. 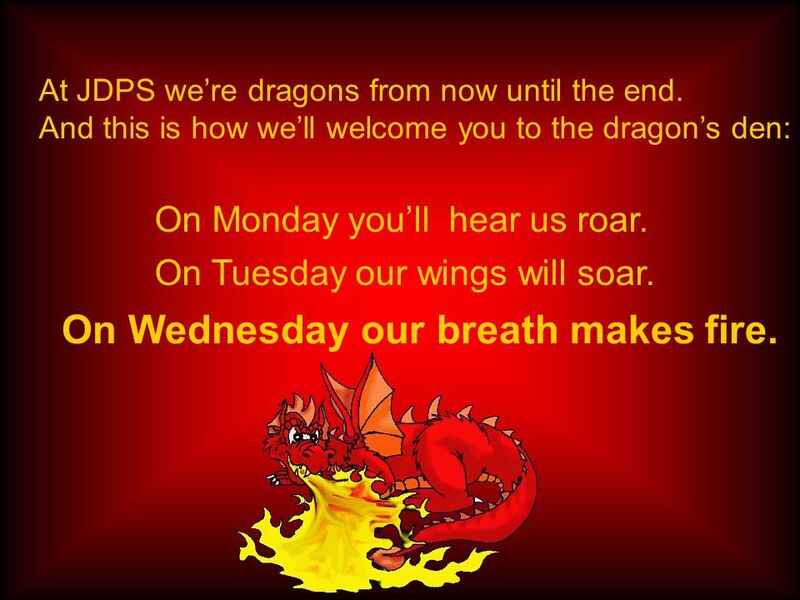 7 At JDPS we’re dragons from now until the end. 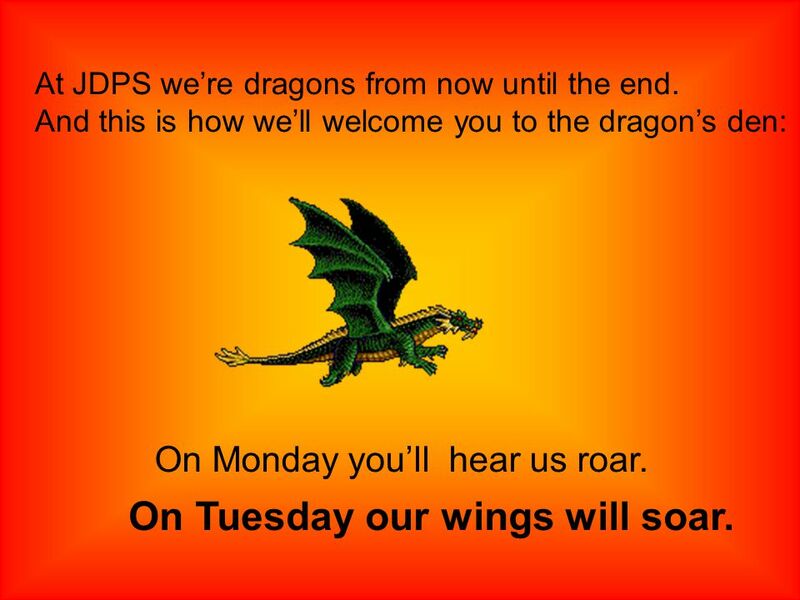 And this is how we’ll welcome you to the dragon’s den: On Tuesday our wings will soar. On Thursday we sing like a choir On Monday you’ll hear us roar. On Wednesday our breath makes fire. On Friday our jaws will snap. On Saturday we’ll give a clap. 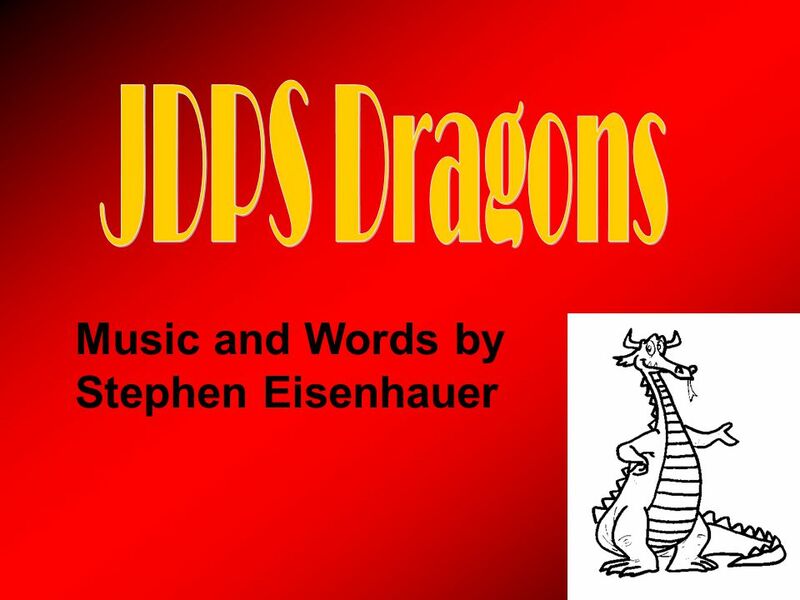 8 At JDPS we’re dragons from now until the end. 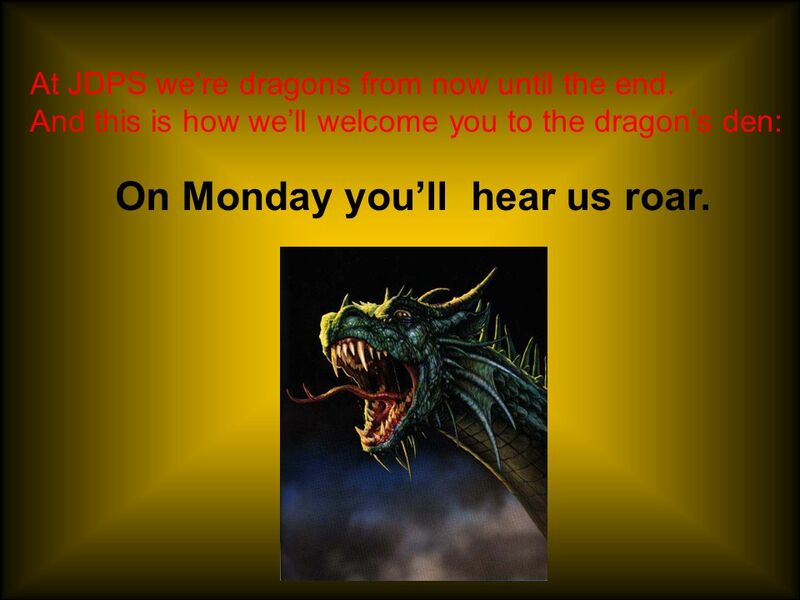 And this is how we’ll welcome you to the dragon’s den: On Monday you’ll hear us roar. On Tuesday our wings will soar. On Wednesday our breath makes fire. On Friday our jaws will snap. On Saturday we’ll give a clap. On Thursday we sing like a choir. On Sunday we take our rest, But everyday we try our best at JDPS! Download ppt "Music and Words by Stephen Eisenhauer. 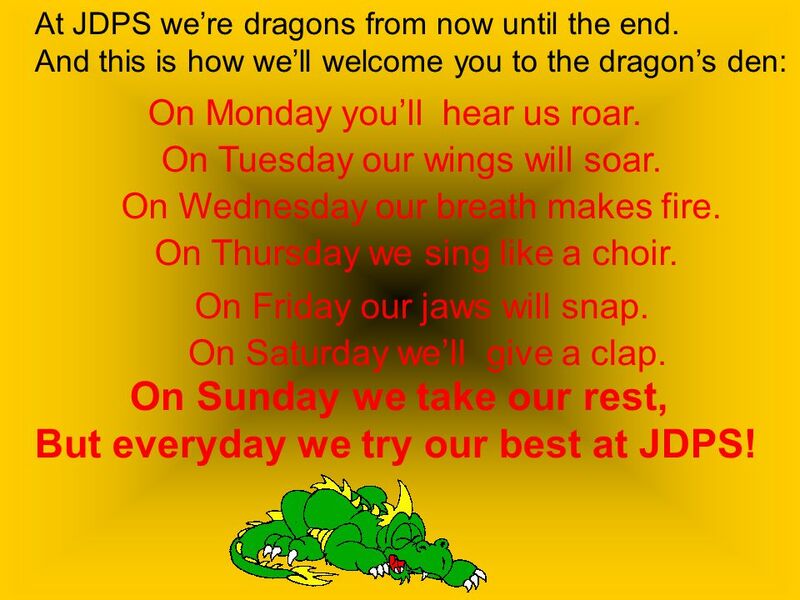 At JDPS we’re dragons from now until the end. And this is how we’ll welcome you to the dragon’s den: On Monday." Die Tage The German Days of the Week. German Days Montag = Monday Dienstag = Tuesday Mittwoch = Wednesday Donnerstag = Thursday Freitag = Friday Samstag. Year 10 ISA Controlled assessment Week starting March 4 th 2013. Operation Research By Anitha Chandran Chitra.R Radha.R Sudhit Sethi. Problem of the Week! Max was in charge of getting the equipment for the 14 people on his baseball team. He made sure he had 8 bats and 38 baseballs. He. TEST YOUR READING SKILLS : See a day of the week written in French. Say what you think it is. Click to check your answer. SUNDAY MONDAY TUESDAY WEDNESDAY THURSDAY FRIDAY SATURDAY. Time Zones The World is divided up into 24 time zones. Each time zone is approximately 15 degrees of longitude wide. The time within each time zone has. My Plan to Go to Around the world By: Benedict/5C.